The Opal Gemstone - "Queen of the Gemstones"
Opal is one of the world's most beautiful and precious gemstones with 95% of the world's Opal coming from Australia. Opal is one of only six types of precious gemstones found on planet earth, sharing prestigious company with Diamonds, Emeralds, Rubies, Sapphires, and Pearls. Opal takes millions of years to form inside of our planet earth and is extremely difficult to find and extract. Each piece of Opal is “One Of A Kind” and can never be replicated or reproduced! The truly phenomenal thing about the Opal Gemstone is that it can display all of the colours of the spectrum. The “play of colour” found in Opal is the result of interference and diffraction of light passing through tiny silica spheres in the microstructure of Opal. This means the bright rainbow colours of Opal, as they appear to the human eye, will move and change dramatically depending on the angle at which the stone is viewed as light refracts the silica spheres. Boulder Opal comes in a wide array of vibrant colors and patterns and is the strongest type of Opal as it is married to the Ironstone host rock with Winton, Queensland considered the capital of Boulder Opal Country. Black Opal has a dark body tone and can be the most valuable form of Opal which is mined around the town of Lightning Ridge located in Northern New South Wales. White and Crystal Opal can be found in all parts of the Australian Opal fields and is typically a light or white with color flashes. Coober Pedy is widely known as the the capital for Australian White and Crystal Opal. 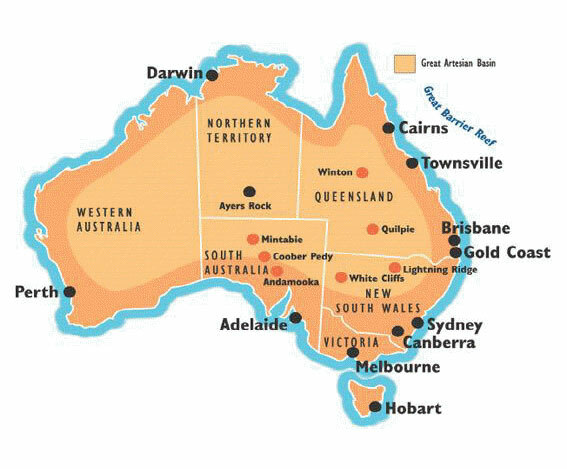 All Australian Sedimentary Opals from these fields have the same chemical and structural make up only with the host rock being the difference. Boulder Opal is found sparsely distributed over a wide area of Queensland Australia, sandstone or ironstone boulder country where the Opal fills cracks and crevices in the ironstone boulders. Opal bearing boulder is always cut including the host ironstone. 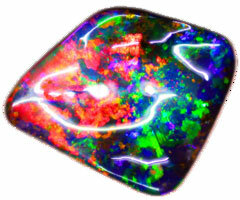 Boulder Opal is in very high demand and extremely precious. Boulder Opal is usually cut to the contours of the Opal vein creating a baroque wavy surface and is often freeform and irregular in shape, making boulder Opal unique and exclusive among it's peers. In Boulder Opal there is a colour and pattern to suit everyone’s taste, from the brightest flashing red through to electric blues, greens, orange, pink, purple and many more in every shade you could imagine (every colour of the spectrum). Black Opal is found in Lightning Ridge and is characterised by a dark body tone which can range from dark grey to jet black.Because of their dark body tone, the rainbow colours in a black Opal are very vibrant and stand out much better than lighter Opals.Opal is currently being mined from depths between 1 metre (3 feet) and 30 metres (90 feet) below the surface. The Opal is found in sedimentary rocks that were deposited in a freshwater environment during the Cretaceous period, about 110 million years ago. Coober Pedy produces the bulk of the world's white Opal. Known as the Opal capital of the world (because of the quantity of precious Opals that are mined there) Coober Pedy is a town in the northern part of South Australia. It is renowned for below ground residences, mostly in refurbished mines, due to the scorching daytime heat. The harsh summer desert temperatures mean that many residents prefer to live in caves bored into the hillsides ("dugouts"). It remains at a constant temperature, whereas surface living needs air-conditioning, especially during the summer months, when temperatures often exceed 104 degrees fahrenheit. 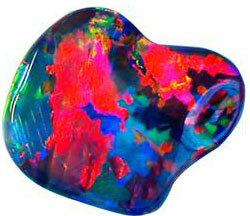 The Opal from Coober Pedy is mainly light or white Opal and is largely used in the production of doublets and triplets, with the backing layer enhancing the colours of this light Opal. Solid Opal is a natural stone that is mined out of the ground and simply cut and polished. There are no additives or glued backs or caps on them. 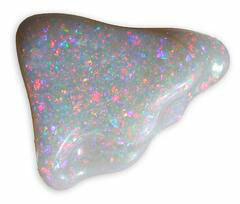 As such, these are the most valuable form of Opal. A Solid Australian Opal is an excellent long term investment as it will never deteriorate and only increase in value over time. Additionally, there are no two solid opal gemstones that will ever be exactly alike so you can be assured that your unique piece is the only one in the entire world. A Solid Opal Gemstone is the perfect heirloom to pass down generation to generation. Additionally, Solid Opals will never be damaged by water as the stone is 100% natural. For information on how to care for your Opal gemstone and Jewelry, please see our “Care & Handling” page for more. Opal Doublets consist of two layers and are a thin section of either precious or crystal Opal, glued to a glass, potch, tourmaline, or ironstone boulder backing but with no crystal cap to cover the Opal. The thickness of the Opal in a doublet can vary, however it is generally thicker than the Opal found in a triplet. 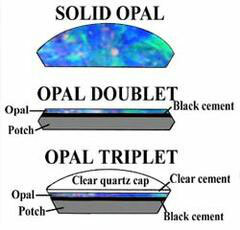 Opal Triplets are a very thin slice of precious or Crystal Opal glued to a black base of glass, potch or semi precious stone such as tourmaline and covered with a clear natural crystal cap, as the name implies a triplet contains 3 layers. Adhering the slice of Opal to a black backing along with adding a crystal cap causes the colour to become much darker, more vibrant as well as magnified. Because of the crystal or quartz cap on top triplets can be a lot more resistant to impact than solid or doublet Opal stones offering an affordable entry point for budget conscious customers. Pure gold is 24kt (or 24 karat) and is extremely soft. Therefore, most pieces of solid gold are sold in 18kt, 14kt or 9kt. This allows the jewelry to be durable enough to last generations of wear. Gold-filled is the next best thing to solid gold in terms of price and allergy sensitivity. Gold-filled jewelry is created by laminating a sheet of gold over a brass base metal. The total amount of gold must be 5% of the total weight of the piece. Gold-filled items are 50 to 100,000 times thicker than regular gold plating and gold-filled jewelry can last for many years and is a good quality metal. Gold plating Gold plating has a thin layer of 18kt gold on top of a base metal. Sterling Silver is 92.5% pure silver. Some of our pieces of Sterling Silver are made by hand by Artisans the traditional way and as such the Sterling Silver may tarnish with time and must be cleaned to maintain the luster of pure silver. Other pieces of Sterling Silver are Rhodium plated which helps prevent any tarnishing. Electroplating uses electricity to coat metals such as brass or copper, with a thin layer of another, more precious metal, such as gold or silver. Plating has two components: one, which gives the plating its color, and the other, which gives the plating its brightness. To learn how to care for your Opal Jewelry, please visit our “Care & Handling” page. Finger sizes can vary from one person to the next, so it’s important to check your ring size before placing your order. 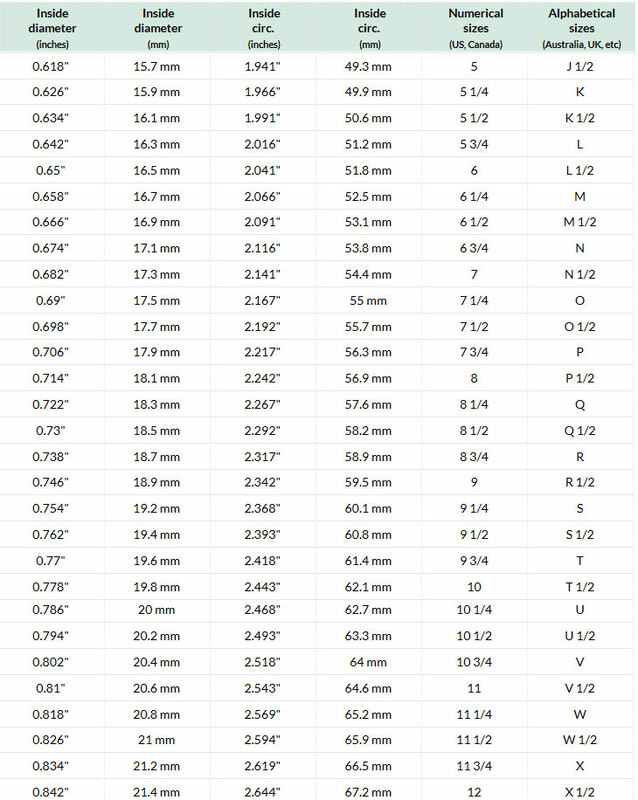 Please see this “RING SIZE CONVERSION CHART” to ensure that you’ve selected the right size. Our adjustable rings fit most finger sizes.